This is a rare opportunity for investors to buy valuable unclaimed property from the State of Colorado at low online auction prices! The State of Colorado periodically sells unclaimed items found in safe deposit boxes like fine jewelry, loose diamonds, gold bullion and collectible coins and paper currency in live public auctions. 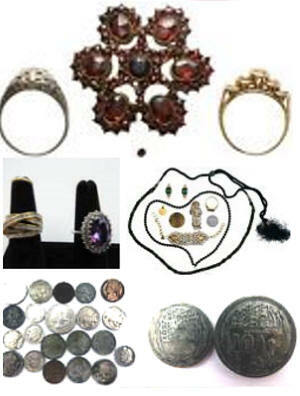 Items listed below may include Colorado unclaimed property and estate sale items. The State of Colorado lists unclaimed property for auction online at regular intervals. If you don't find Colorado unclaimed property items listed above, please check out unclaimed property auctions from other states listed below. The Colorado State Treasurer currently maintains a list of over 1.7 million names of individuals as well as businesses for whom property is available. To see if you or someone you know may have money or property being held by Colorado visit the Colorado unclaimed property search site or call 303-866-6070 or 800-825-2111.